NYU professor Paul Levitz speaks to a crowd at a Raising the Bar event. Photo courtesy Raising the Bar. Bar room talk need not be a lowly affair. Why not discuss bioethics over your brews? Or social psychology with your Scotch? Such is the entreaty of Raising the Bar, a new organization making its first appearance in San Francisco tonight. Raising the Bar has a simple mission, to organize academic lectures in bars, yet its ambitions are lofty. Luvish says the social startup is about breaking the barrier between the ivory towers of academia and the more democratic terrain of the bar room. 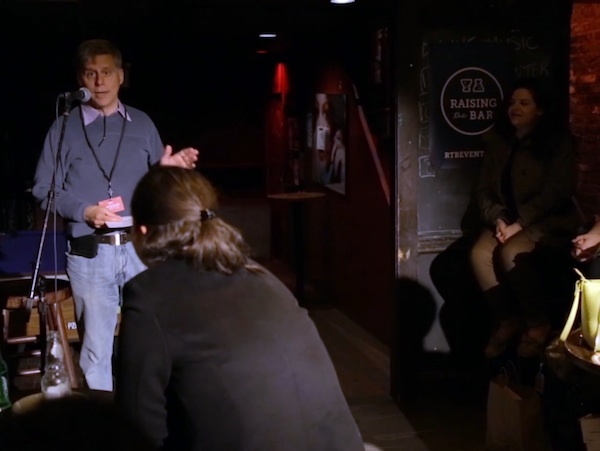 Since its founding last April in New York by a group of Columbia students, Raising the Bar has hosted 50 lectures in 50 New York bars with roughly 9,000 bar patrons listening to lectures from topnotch professors on everything from philosophy to philology. In San Francisco tonight, 20 professors from Berkeley, Stanford, USF, and Santa Clara University will post up in 20 different bars to share their knowledge with the public for free—though you’ll have to buy your own drinks. Lectures include Stanford’s Joshua Landy on “Fictions that Train Your Brain,” Santa Clara University’s Brigitte Charaus on modern disasters, and USF’S Joshua Gamson on the rise of celebrity culture. In the Mission, Slate Bar hosts Santa Clara University’s Lawrence Nelson to discuss the bioethics of physician assisted suicide and Stanford sociology professor Robb Willer gives a lectured titled “Finding Meaning in a Fucked Up World” at Dear Mom. San Francisco is the first stop on a world tour. Raising the Bar will be hosting events in Hong Kong, Sydney and, in one single night, Vienna, Berlin, and London. For a full roster of lectures available tonight in San Francisco, and to reserve your spot, you can visit Raising the Bar’s website here.